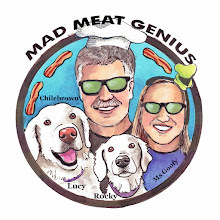 MAD MEAT GENIUS: WHERE'S THE GRAVY? Doctor Biggles, who is famous on the internet, let me play with his 'Butterball Turkey Deep Fryer". 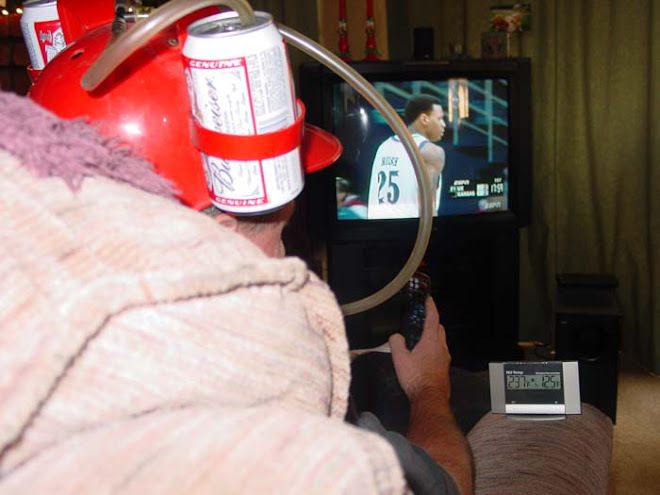 This contraption is pretty slick. It is powered by electricity and is safe to use inside your abode. It is possible to cook a 10 pound turkey in 40 minutes. The skin will be crispy and the interior moist and juicy. We shall see. The first step is to purchase 2 gallons of oil and a turkey. We went to the local Mega-Wally-Mart and found appropriately a 'Butterball' turkey and some cheap 16 dollar oil. The oil seemed like a big expense. Sure you can strain the oil and store and save it in your ice cave but who wants to have 2 gallons of oil taking up valuable real estate in your food locker. Once home we defrosted our bird. This bird was getting an overnight bath in a simple brine. We set up a cooking station in our outdoor patio. This unit was made for indoor use but our patio is covered and I wanted to take no chances with hot bubbling oil. This fryer is simple to use. Plug it in and turn it on. Set your temperature to 375. and wait for the go ahead light. Forty minutes later our bird was done. The only problem is, where is the gravy? Luckily 'Butterball turkeys come with a gravy packet. 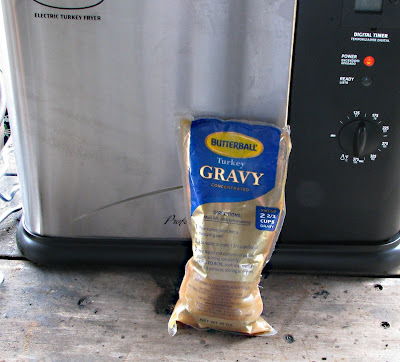 This is a godsend for the gravy challenged or people that deep fry their bird. The gravy actually turned out very decent. The turkey was one of the most moist and juicy bird that we have ever eaten. The skin was crispy and not oily. There was one problem. The meat was not exciting, bland and basically a texture of protein. Ms. Goofy and I both agreed we missed the added flavor of roasting. 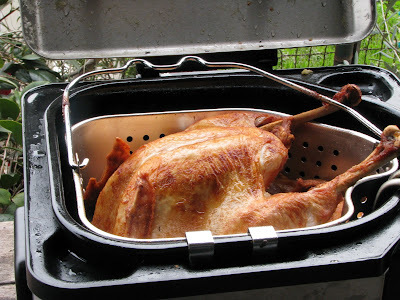 The Butterball Electric Turkey Fryer is a nice unit. The electrical cord which is held by magnets seemed a little over cautious and was a minor nuisance. Except for this, the Fryer does everything as advertised. If we fried frequently this would be a welcome addition to the kitchen. We think we will stick with roasting our bird on the Weber. What's that green stuff behind the grill in that first photo??? oh, it's grass, I didn't recognize it at first since our yard has been covered in snow for two months!! I didn't know Butterballs came with gravy packets! I agree, a nice idea for those fried turkeys. Hmmm, looks as though am still famous on the interwebs! I rule. My dad fries turkeys all the time. He has to do them outside because his fryer is propane powered. Before frying, he injects the bird with seasoning -- usually a Cajun blend. Yeah - ya gotta inject a turkey before you fry it. But I wouldn't inject a butterball - it's already been done for you. I make sure I season the turkey under the skin whenever I fry it. That's the best way I know to get flavor to the meat. As for the indoor fryer - I love mine. It works exactly as advertised. The reason your bird had no taste is it's a Butterbomb. Try it again with a nice, free-range turkey, a small one. El Cerrito Natural Grocery has 'em. highlandsranchfoodie, We do not get freezing weather very often. The garden grows year round. Rev. Biggles, Thanks for letting me play with your fryer. Kailyn, I think I would like Cajun blend. We are just waitin for the invite. WhiteTrashBBQ, Spoken like a true KCBS Certified Judge and competitor. I saw your review. Cookiecrumb, Sometime we do what we do because! Zia, Rotisserie huh, I do have my eye on an attachement that goes on the Weber that turns it into a rotisserie. My birthday is next month. Zoomie, I am afraid that is not going to happen. That turkey will have to stay home on the range. I was wondering about those and just watched Clint's video using his this morning over at Smoke In Da Eye. Gah! I hate those magnetic catches for power cards. The last deep fryer we owned had one of those and I ended up throwing it away. It would never stay attached while cooking and temps would drop. Chris, I think you should have to sign a Darwin release slip when buying. This is what I use on my fried birds and its delicious. Tony's also makes pre mixed ones that you can buy at the market. Thanks Ribsasmokin, We will give that a try. I think most of our birds will be roasted in the future.